Wherever you go these days you are bound to see cameras. Cameras of every size, style and price tag. There is very little that happens in the world today that is not caught on camera in some way, shape or form. One the most popular ways to capture video today is by using the small point of view action video cameras. These little beauties allow you to capture an image or a video from a variety of different perspectives. This makes for some epic home videos and some great action shots. If you don’t have one yet, here are just a few reasons why you should get one. The POV Perspective: This a great angle for those who want to see what you were seeing as it happened. Some people strap them to their chest. I personally think that you get the best POV shots when it’s strapped to your helmet. This way the camera moves with your head and follows your line of sight. The Underwater Perspective: It doesn’t matter if you are just playing around in the pool, on the beach or diving on a shallow coral reef. Shooting underwater videos and photos is just fun and cool. These cameras almost always come equipped with waterproof housings that give you the freedom to get the wet shots. The Vivitar DVR786 comes with a waterproof housing that’s good up to 30ft and protects it from impact damage both at sea and on land. It comes ready to handle anything you can throw at it on the beach, at the pool or even on a nice shallow reef dive. I know most of these cameras go for a couple if not several hundred dollars and are not within everyone’s reach. So naturally a lot people are missing out on the “action” so to speak. The Vivitar DVR786 gives everyone the opportunity to see what they been missing out on at an affordable price that is within just about everyone’s reach. 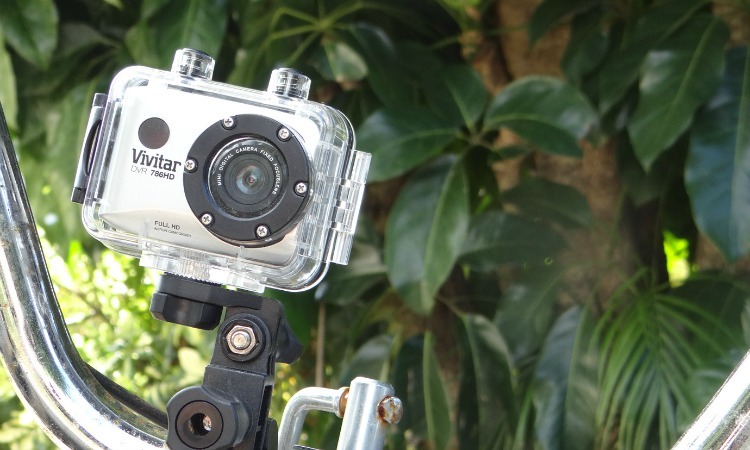 It comes fully equipped with the protective casing that is both shock resistant and waterproof up to 30 ft, a remote control, a mount for your bike or ATV and a helmet mount for the awesome POV perspective. This awesome little camera records in full HD and has a 2.4″ touch screen display. You can take your chances and enter win one of these beauties below or head out and grab one from your favorite store, or both. It’s available online through Amazon and at your local Walmart, Target and other retailers. It retails for $59.99. What would be your first action video with one these beauties? I would love this camera for our kids! They would really enjoy using it outdoors! These action video camera perspectives sound very interesting. Thanks for sharing! The Vivitar DVR786 camera looks really nice and it has an affordable price. Thanks! My first action shots would be my sons playing soccer. An actual soccer match so we can see it at a different angle or when they go down water slides! Enjoyed reading more about this camera. I think it would be perfect for my teenaged son. This looks great! I’d be able to capture more moments with the kids on our adventures. This would be a gift for my nephew. He would probably shoot one of his tennis matches or a skateboard ride. This camera would be great for when I go camping and hiking. I love how we could use itt when we go scalloping in the summers..
Finding an underwater camera is expesive.. I like that you can use it underwater. Being shockproof and waterproof up to 30 ft, this camera seems ready for any adventure you may tackle! The great thing is that it is not so expensive that you want to ‘baby’ it; it would be perfect for a teenaged daredevil! This would be wonderful for my girls and all of the adventures they go on. This camera sounds awesome, love it’s equipped with the protective casing. This would be so good to have for my husband, he rides in charity bike tours and what a great way to show video to those who couldn’t go. It would be great for anything! How fun! There are so many things these days to capture life’s moments! My kids would certainly enjoy one of these while they are explore and play on our 25 acres. Wow, that is a reasonable price and looks like it would be a lot of fun on family adventures! I can see my family having a ball with this action can. Especially sledding and underwater. This sounds like an excellent camera. I’d love to have this when we are biking or hiking. It would be awesome to capture some of our adventures via this camera. This would be a great camera for capturing all the special moments. It’s also great that it won’t break the bank too. would be a great thing for the kids. This would be an awesome camera for my son, who does a lot of biking! He’d love to mount this on his handlebars! I would love to have this action camera for my Grandson who races go karts, he would be thrilled to have it. This would be great for ghost hunting investigations. This would be great to capture hikes and walks at the beach! The bike ride perspective is great! I did this with a tripod on Mackinac Island here in Michigan and captured some great shots! our nephew wants a go pro this year for Christmas i think this would be a great alternative to the go pro camera. I am a very outdoorsy person and hope to have my grandchild enjoy some backpacking trips with me. Would love to have some videos for some great memories. I am really intrigued by this camera! i currently am int he market for a new one and this one has feartures and affordability! i am hoping to find this camera in one of my local stores! I want a camera and I love that you can use this is the water! I like that there are some less expensive action cameras out there! I have 3 girls and we recently moved from a small condo to a larger house with a huge yard. they are all starting to get older and learning fun things. I have actually been looking for a camera that can keep up with all they have going on, learning to ride bikes, starting tae kwon do lessons, my oldest, who just turned 8, is getting into skateboarding. I really enjoued your review. the first two perspectives would be great for them. as for the third….. ive been to the bahamas twice on cruises and plan to go again at some point. I cant even imagine the gorgeous shots i could get underwater!! 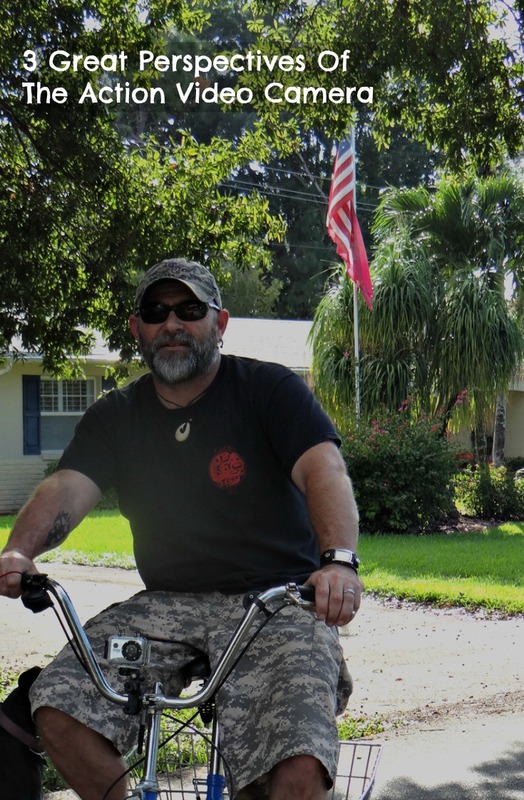 I think it’s great that you were able to put the camera on your handle bars and take some shots outside! I like the POV perspective. This camera sounds great. The views are great when taken from the POV perspective. My kids would live this! My daughter would have a blast with this! I’ll bet you’ve gotten some great video while riding. This would make a great present for my nephew. I’ve never tried using action video cameras, but they look like they’d capture some great memories! My kids would have a field day with this! I really like the The POV Perspective! I would love to just have my daughter wears this at the park or on the trails, just to see what she sees! This camera looks awesome! My nephews would love it for their bikes — they are so active. It would be great to make videos of the kids and the dogs. My kids would film their pets 4 cats and 3 dogs they would have so much fun with it. This would be great to take camping. I would capture a video of our family Christmas party first! My sons are always wanting to get everything on video….I think it is a very generational thing….I prefer photos. I would love to have this for my husband when he goes hunting. He is always seeing very interesting animals when he’s out. I would love to get some video of Dad playing with the grandkids. I like this video camera. It is a great alternative to some of the other more expensive ones. This looks like it’d be great for vacations. that would be awesome to take on my cruise! I would love to film things underwater. This looks like so much fun! I’d probably put this to use during our next rafting vacation. My kids would love to record themselves doing all sorts of fun things and the price point on this makes it affordable! I found the information on using perspectives interesting and useful. I would film dog play. This looks like a nice camera and definitely worth the price. I think I’d use it to record the action mostly. I think my son would really enjoy using the POV perspective!